The Summer of Family Travel Giveaway- Mexico! Enter the Summer of Family Travel Giveaway to Win an All-Inclusive resort stay in sunny Mexico! Enjoy 4 days/3 nights for a Family of 4 at the resort Velas Vallarta, in Puerto Vallarta, Mexico, for a great summer of family travel. This year is the Summer of Family Travel. As the school year draws to a close, and you begin prepping for your summertime family travel adventures, we wanted to provide you with some resources, information, tips, deals and more with the launch of I Love Family Travel’s The Summer of Family Travel series. There will be posts throughout the summer, all focusing on family travel. To celebrate the launch, we’ve teamed up with the ILFT crew, Bloggin’ Mamas and a whole bunch of traveling bloggers, to bring you a #FamilyTravelChat and a huge Giveaway! Join us on Twitter Thursday, 5/19/16 at 9p ET for the #FamilyTravelChat, as we chat about summer vacation plans and deals, travel gear and more! One random chat participant will win some prizes from AquaVault® and our other sponsors. To make it nice and easy for you to follow, here’s the link to the twitter list with everyone: https://twitter.com/ILvFamilyTravel/lists/familytravelchatpanelists/members. Enter The Summer of Family Travel Giveaway! Does a nice all-inclusive resort stay in sunny Mexico sound good to you? 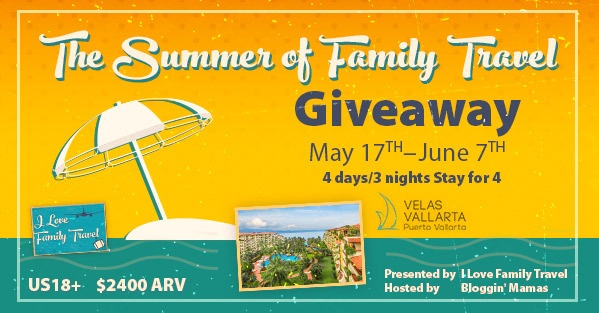 Well, thanks to our sponsor Velas Vallarta, we are giving away a 4 day/ 3-night all-inclusive stay for a family of 4 at their resort in beautiful Puerto Vallarta, valued at $2400!!!!! Planning for a vacation can be a hectic time. Rooms need to be booked, travel routes planned, purchasing needed items for everyone in the family. It can add up to one big headache. Let us help alleviate the pain of Vacation planning. Enter the Vacation Time Event 2015 giveaway, for your chance to win. Imperfect Women and Momma Without a Clue. It’s that time of year when school is winding down, vacations are planned or being planned and the whole family is looking forward to this year’s vacation. Our amazing Sponsors, We Love Travel Deals and Skinny Ideas with Venus Kem, have enabled us to have some incredible prizes to help you with this year’s vacation!! Kindle Fire HDX- arv: $379-Relax and read! Amazon Gift Card- arv: $100- For lots of books to read, or maybe a swimsuit or two? Vault Pro Tote- arv: $90 This bag has built in RFID blocking and straps that can’t be cut and it’s secure!